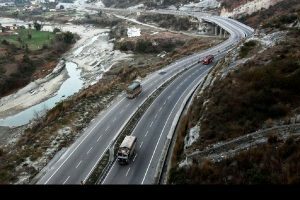 India and Nepal on Thursday decided to speed up the pace of various development and connectivity projects as part of their commitment to maintain the new momentum in bilateral ties. External Affairs Minister Sushma Swaraj met her Nepalese counterpart Pradeep Kumar Gyawali and reviewed recent developments in bilateral ties across diverse sectors, including progress achieved on the three transformative initiatives launched in 2018 in the areas of agriculture, railways and inland waterways. The two ministers expressed satisfaction at the significant progress made in different sectors of cooperation as a result of intensified bilateral exchanges at all levels in recent months. Gyawali extended an invitation to Swaraj to visit Nepal to co-chair the next meeting of the joint commission which was accepted. The meeting will be held at an early date. Gyawali, who is here to address the 4th ‘Raisina Dialogue’, said the two countries were committed to reinvigorating their ties in diverse spheres. “We cherish India’s progress and prosperity,” he said. He added that the two countries were currently focused on cross-border connectivity to unleash their development potential. Nepal was advancing its connectivity with India by railways and waterways. The visiting minister also said that Nepal was also happy over the improvement in bilateral ties between its two large neighbours – India and China. In this connection, he referred to the informal summit between Prime Minister Narendra Modi and Chinese President Xi Jinping in Wuhan in April last year.